GOLF CAN BE an intimidating game that is literally in a foreign language. Birdie, one under par, Eagle, bogie, albatross... Could a beginner pick it up in just three short days? The Luxury Travel Bible was prepared to find out. On a recent trip to Donnafugata Golf Resort and Spa, Sicily I felt like learning something new. As the resort I was staying at prides itself on their golf centre and two 18-hole championship golf courses I felt I was ready for the challenge. Now don't get me wrong, I was worried. I am more a spa kinda girl than a sporting one and didn't Mark Twain once say 'Golf is a good walk spoiled'? As I walked down to the practice area, gazing longingly at the spa and sun loungers as I passed, I was hoping that my Northern Irish heritage would stand me in good stead (even I knew that it is currently the golfing capital of the world)! Our beginners group was, I have to admit, a bit of a motley crew (in the nicest possible way). All beginners and all the types you would expect for such a lesson at a luxury resort. A woman wanting to learn in order to play with her golf-mad husband, a man who had played before but needed to have professional guidance, another who had hit the driving range before but never ventured onto an actual course and a gaggle of complete beginners all faced our teacher in awe. Our tutor, Gary Hughes was extremely friendly, helpful and most importantly patience. He didn't even batter an eyelid when the clubs were referred to as 'sticks'. On the first morning we gathered at the driving range and picked up our drivers (the big ones for hitting the ball off the tee) but before we could attempt to strike the ball with the club Gary had us throwing balls with our hands towards the driving range. This was in order to get us used to the movement of swinging the club. Then we attempted to swing the club and launch the ball. It wasn't a good start and there were plenty of groans, swear words and cries as the ball did not go where we wanted it to. More often than not my golf balls rolled off the tee a few inches in front of me rather than flying into the air as I had planned. The great thing about our lesson was that we all got one-on-one time with Gary who watched us and gave us the individual feedback and advice we needed for our game. And then... it all clicked into place. WHACK! The ball flew in the air, albeit by only a few feet. That sound and sight was one of the most satisfying things in the world. I will now gloss over the point that once I thought I had this golf thing cracked it all fell apart but it did eventually start to fall into place. Over the next two days I eagerly attended further lessons on putting and driving (all while still managing to fit in sessions at the spa and sightseeing). It was decided that we should attempt to move from the safety zone of the practice area to the actual golf course. Having gained confidence amongst fellow beginners the prospect filled us will dread, but as our teacher pointed out that wasn't playing golf - you need to be on the course to do that. ... it was amazing how much knowledge we had picked up in our lessons in just a few short days. We teamed up for a four ball with three beginners and a golfing friend. Initially we were having more fun driving the golf buggies but it was great to be out on the course. 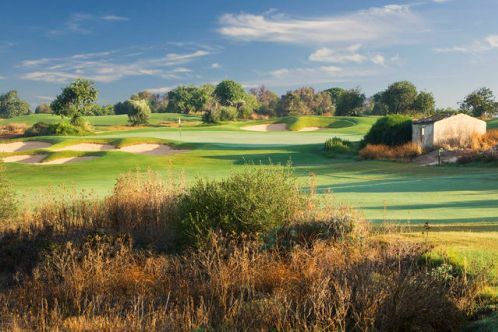 Donnafugata's two golf courses are beautiful as they should be having been designed by golfing champion and legend Gary Player (the North Parkland Course - a Par 72 and 6,666 metres long) and Italian course designer Franco Piras (the South Links course - a Par 72 and 6,650 metres long). The surrounding views are also stunning to look at when you are not focusing on the tiny white ball. Yes we lost some balls, yes we were getting to the hole in twenty-something as opposed to in four, yes we were slow and had to let other players overtake us but we got there eventually and we all had a great time. As we chatted while we went round the courses it was amazing how much knowledge we had picked up in our lessons in just a few short days. So, I say if you want to learn golf, give it a go. Everyone I encountered in my lessons was friendly and eager to learn. The professionals and golfers on the course were also helpful, courtesy and patient towards beginners. They also wanted to share tips and advice, not to patronize but to help. Oh... and I lied when I said that the sound of the club hitting the ball is the most satisfying thing in the world. I now know that the most satisfying thing in the world is the cold drink at the 19th hole after a morning on the course. Donnafugata Golf Resort and Spa is an initiative of Sotogrande.